Gorno-Altaisk (Russian: Го́рно-Алта́йск GOHR-nuh uhl-TIGHSK) is the capital of the Altai Republic. Situated in the foothills of the Altai Mountains Gorno-Altaisk has a population of around 55,000. Most of organized tourist groups pass by the city since it is not on the routes to major destinations however there is a lot to see. The city is located on the northern border of the Altai Republic in a valley of two rivers. Millions of years ago it was a lake here, but the feeding river Maima changed position and the lake disappeared. Ancient people started to settle here hundred thousand years back. Sprawled 10km from east to west and 7,5km from north to south, the city has 200 streets and pereouloks. The main ones are Kommunistichesky Prospekt, in parallel to Choros-Gurkina Prospekt and Lenina Prospekt. Kommunistichesky and Choros-Gurkina Prospekts are concentration of shops, cafes, banks, education and administrative buildings. Thanks to the number of institutes the city is full of young students (over 5000) and weekends are always some sort of holiday. However herds of cows could be seen walking around the streets. "Angara" airlines have reopened regular flights from Novosibirsk since December, 2010. Flights are carried out twice a week and a ticket costs 2300RUB one-way. "S7" (formerly, "Sibir") airlines runs regular flights from Moscow. Flights are carried out twice a week and a ticket costs from around 9000RUB one-way. Airport is 6km off the town. Slowly and rather sedomely (times are posted at the bus-stop) the bus 103 makes its way to the city bus-station from the blue plastic bus-stop left from the airport parking lot as you exit the airport building. 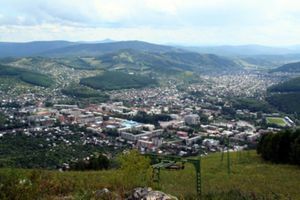 Private taxis drive to Gorno-Altaisk from Barnaul and Biysk, buses depart from Biysk (every 2 hours), Novosibirsk, Tomsk, Kemerovo. Chuysky Highway is at the distance of 5km. The bus station is in the center of the city. From here private marshrutkas and taxis carry passengers to every town in the region. In 2013 the construction of the railway from Biysk is planned. The main transport in town are buses and marshrutkas (30 routes). Taxis are from 60RUB. On a sunny day a walk takes 2 hours. Museum of regional studies. 46, Choros-Gurkina st. Archeological findings, paintings of Choros-Gurkin, who is the first Altai painter, old photographs. The Drama theater (a big white building with animal ornament) offers plays in Altai and Russian languages. Art-salon Enchi of ethnic art. Address: 38, Choros-Gurkina st. There are trails to the mountains and as the mountains are quite high, the views are fascinating. Mountain ski base (two hills 641m and 421m high ) is very close to the city. Operates from December to March. Of course, cheese, espcially hard sorts of cheese. Altay Balsams. Kommunistichesky and Choros-Gurkina Prospekts are abound with shops, convenience shops and supermarkets. All cafes and restaurants are located along the main streets. The natural water springs are coming to the earth surface at the Central Park alley opposite the City Hall and at the Dinamo stadium. There is a hotel just next to the central plaza that charges around 10e/night. Rooms are crappy, toilets (that probably do not work) are on the corridor. Shower costs extra 50RBL. Staff speaks only Russian, service is rude. Some rooms have a TV. Pautina (Паутина), internet-cafe at the University. Traveler's Coffee, coffee house on par or better than Starbucks; free wifi. Cafe Natalie, restaurant with little more formal feel; free wifi. Either Mongolia to the south or Tashtagol to the north. This page was last edited on 1 July 2018, at 07:33.